Despite its knobby and odd-looking exterior, celery root happens to be quite lovely on the inside, emitting a delicate scent of celery upon slicing it. The first time I tried it was in a Tal Ronnen soup recipe, which he had paired with granny smith apples and chives. The flavor of this delicious root was so clean and fresh, I began to think of different ways to use it as well as other flavors to pair it with. Because it is very similar in texture to a potato, I grated it up like hashbrowns and fried it to see what would happen. The outcome was delicious: the texture was slightly softer than potatoes, and it paired perfectly with tart granny smith apples and a fresh basil cream sauce. Combine the vegan sour cream and basil, set aside. To peel the celery root, slice off both ends of it so you can lay it flat on a cutting board. Using a sharp knife, slice off the skin in strips, keeping as much of the root intact as possible. Quarter the fully peeled root, and grate each of the sections on the coarse side of a grater. Heat the oil In a medium-sized skillet over medium-high heat. Add the grated root and saute until well-browned, about 15 minutes. Serve with the basil cream and a sprinkle of the chopped apples. What a great idea! 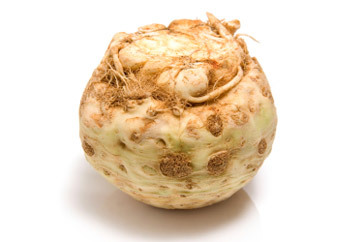 Celery root is such a wonderful vegetable and I haven't had it in ages. That looks and sounds amazing! I can't wait to try this–thanks! This looks so classy! I love celery root; it has such a delicate taste. Awesome that you bumped it up with basil. So creative and classy looking! 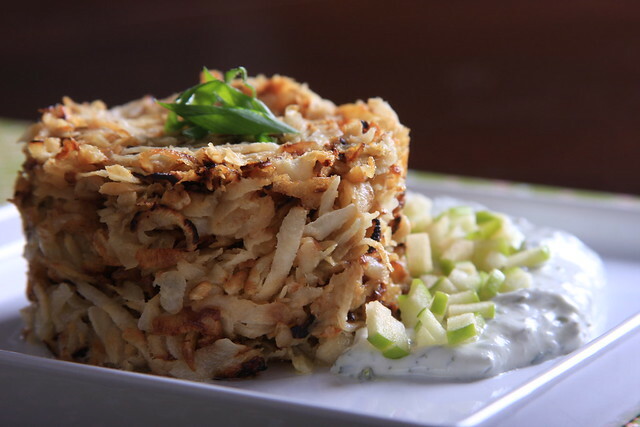 Celery root is something I've yet to try, I'm might attempt this for one of our next brunch gatherings.